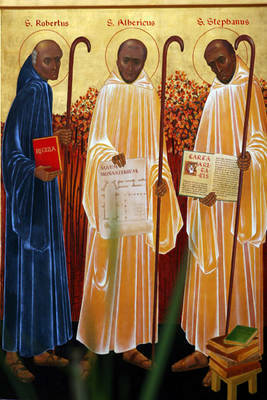 Cistercian Founders St. Robert, St. Alberic, and St. Stephen Harding. 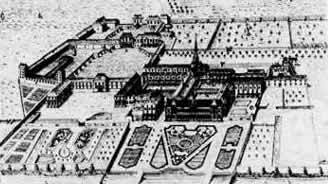 The Cistercian Order finds its historical origin in Cîteaux, a French monastery founded in 1098 by a group of monks under the leadership of St. Robert of Molesme. Having left behind the Abbey of Molesme to found a new monastery, the community set out intending to live a life faithful to the simplicity of the Rule of St. Benedict. Inspired by the age’s strong spirit of ecclesial and monastic reform, they wanted to set aside some of the developments in monastic life associated with the distinguished and influential Benedictine Abbey of Cluny. Concretely, St. Robert and his monks embraced a set of ideals popular among contemporary monastic reformers: among them were the desire for an effective balance between prayer and serious work, an emphasis on evangelical poverty and a detachment from worldly affairs, and a style of community life modeled on the apostles and first Christians (cf. Acts 2:42-47; 4:32-35). Most essentially, they desired to seek out new and authentic ways of living their lives as monks in response to the call of God, a program of discernment that included both a fidelity to a broader and more ancient monastic tradition and a sincere attention to the life and times in which they lived. The fervor and inspiration of the first monks at Cîteaux was soon put to the test. From the sources that are available, it seems some tension arose on account of the somewhat ambiguous relationship between the new monastery and the Benedictine house the monks had left. In order to preserve peace, after only a short time St. Robert was required to leave Cîteaux and return to Molesme in order to resume his duties there as abbot. For this reason in Cistercian iconography he is often pictured as a Benedictine monk wearing a black habit, instead of the traditional white-and-black habit of the Cistercian Order. Some monks decided to return with St. Robert, while those remaining professed their stability to Cîteaux, thereby sealing their commitment to the new reform. As abbot of Cîteaux, St. Robert was succeeded first by St. Alberic and then by St. Stephen Harding; together these three men are celebrated as the Founders of the Cistercian Order with a solemn feast on January 26. Under the guidance of St. Alberic the small community grew, built their first church, and began setting down the practical details of their way of life. During the tenure of St. Stephen the new monastery began to grow at a remarkable rate, with the first four foundations (commonly referred to as “daughter-houses”) coming in rapid succession: La Ferté (1113), Pontigny (1114), Clairvaux (1115) and Morimond (1115). 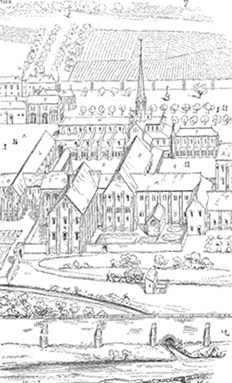 The renewal of monastic life inaugurated at Cîteaux soon expanded into an ever-growing network of closely related but independent monasteries throughout medieval Europe. The desire to preserve a strong sense of unity and solidarity among the spreading communities led the early Cistercians to create a charter of fraternal communication that would keep the monasteries together, one which soon emerged as a watershed in the history of federated governance. Key mandates of the first constitution, titled the Carta Caritatis (“Charter of Charity”), required each Cistercian abbot to make an annual inspection or “visitation” of his daughter-houses, as well as to convene annually with his brother abbots at Cîteaux for a “general chapter” dedicated to the governance and promotion of what had essentially become the first “religious order” in the Church. Such a system of government was seen as a promising way to harmonize the roles of central and local authority, preserving a strong sense of unity while at the same time fostering a healthy independence in each of its monasteries. The system grew so popular that the Fourth Lateran Council (1215), pointing to the Cistercians as a model, enjoined governance by general chapter upon all religious institutions of the age that had not already adopted it.